Recommended for any healthcare professionals and medical personnel who may respond to pediatric emergencies. CE‘s available for EMS and Board of Nursing! For CME’s, please take a PALS online with skills check. **This class is for those who have never taken PALS before or have an expired PALS certification card. A PALS certification, or Pediatric Advanced Life Support certification, is given when you are properly trained to deal with life-threatening situations involving children. A variety of medical institutions and hospitals use PALS procedures. PALS is not for lay people. Only medical professionals will take PALS as you need to have access to drugs and ECG machines to administer the proper procedures. Professions that use PALS in their training include doctors, nurses, first responders, firefighters, medical students, and paramedics. In PALS certification classes, you will learn about the different emergency response techniques applied to certain situations when a child’s life is threatened by a medical emergency. You will use pediatric CPR and techniques to deal with a variety of potential issues. How do I get PALS certified and how long does the certification last? You will need to take a PALS certification class to get certified. If it is your first time, you would take the PALS Initial Course. If you are renewing your certification, you can take the PALS Update or Renewal. The certification card will prove that you took the necessary number of hours of PALS training and passed the exam. The certificate will last two years, and you will need to renew it after those two years. Make sure to renew it before the two years is up, otherwise, you will have to take the Initial course all over again! Where can I take PALS courses? 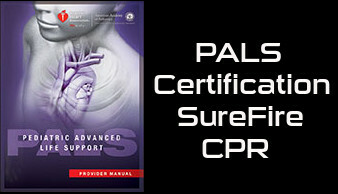 Surefire CPR offers PALS certification courses at all 4 of our locations. PALS through Surefire CPR is affordable, while also being quick and efficient. If your job requires that you take a PALS class, you can rest assured that their courses meet the necessary guidelines for health professionals. There are many advantages to doing your PALS courses with SureFire CPR. They are popular not only for our effective and thorough PALS education, but also because of how they teach their courses. First off, you choose your schedule and class type. You can take the course at their training facility or from your home or office. If you choose to do the training at your office, you can choose the time the instructor comes to do your training. This flexibility is why so many people choose Surefire CPR. In addition to our PALS certification classes, we offer many other certification courses. SureFire CPR offers CPR certification and Automated External Defibrillator training, Basic First Aid, Basic Life Support, Advanced Cardiac Life Support, Pediatric Advanced Life Support, ECG and Pharmacology, Hospital Fire Safety, Neonatal Resuscitation, and Pediatric Emergency Assessment Recognition and Stabilization certifications. Our instructors are medical professionals, such as EMTs, paramedics, firefighters, and nurses, with years of field experience. The instructors involve you in the training, so everyone in the class is at the epicenter of the learning. Additionally, your course instructors will give you useful insights and advice they have picked up from their years of working in the field. If you are a medical professional who wants to get your PALS certification, then sign up for one of Surefire CPR’s PALS training courses today.